Bangladesh Power Development Job Circular 2018 Has Been Published in Daily Newspaper Bangladesh Protidin also to get Bangladesh Power Development Job Circular 2018 by All Exam Result BD. Bangladesh Power Development is a government Organization in Bangladesh Its Most important Organization Of Bangladesh. The Bangladesh Power Development Board (BPDB) was Established as a public sector organization to promote the country’s power sector after the emergence of Bangladesh as an independent state in 1972. The organization is responsible for planning and developing the nation’s power infrastructure and for operating much of its power generation facilities. Recently The origination again looking New Man Power of various positions.If you are interested in government jobs 2018 as well as Bangladesh Power Development Job Circular 2018 is the good one for you or anyone. let, to see here full details which help to get power development jobs 2018. We already were mentioning specific information which helps to know everything with easily. Apply Now!! Application Last Date 15 February 2018. ■Organization Name: Bangladesh Power Development (BPDB) Board. 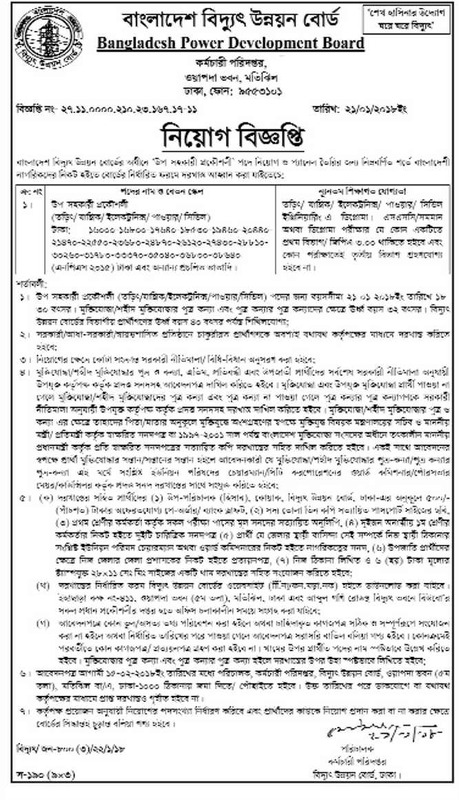 ■Post type:Various Position, Please See Below Job Circular Picture. ■Number of Vacancies: See Job Circular Picture. ■Educational Requirements: See Below Circular Picture. ■Age :See Below Circular Picture. ■Experience Requirements: See Below Circular Picture. ■Job Types: Government Jobs In Bangladesh. ■Jobs Locations: See Below Circular Picture. ■Jobs Source: Online jobs portal and Newspaper..